Knowing how fast a player pitches or runs can instantly influence a coaching decision. And 15 over the limit doesn't seem so excessive when you find out what they're doing down on the track. The Bushnell Velocity will tell you to +/- 1.0 miles per hour using digital technology and DSP (digital signal processing). Knowing how fast a player pitches or runs can instantly influence a coaching decision. And 15 over the limit doesn&apos;t seem so excessive when you find out what they&apos;re doing down on the track. 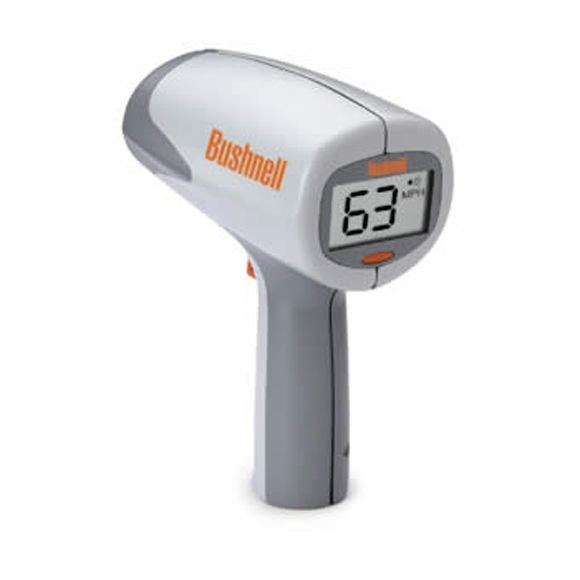 The Bushnell Velocity will tell you to +/- 1.0 miles per hour using digital technology and DSP (digital signal processing). Measure the speed of a baseball from up to 90 feet, or a vehicle from as far as 1,300 feet. Measurements Measurements: 4.3" x 8.4" x6"